Money Clip is designed to securely hold your cash in style. The inside is lined with neodymium magnets and black Hypalon - the same material used for inflatable military boats - which provides as a strong grip to secure your cash. The outside is surrounded with Rustic Brown Horween Leather that will patina over time, creating a look unique to you. How many bills can Money Clip hold? Money Clip can comfortably secure 18 folded bills. How should I care for my Money Clip? 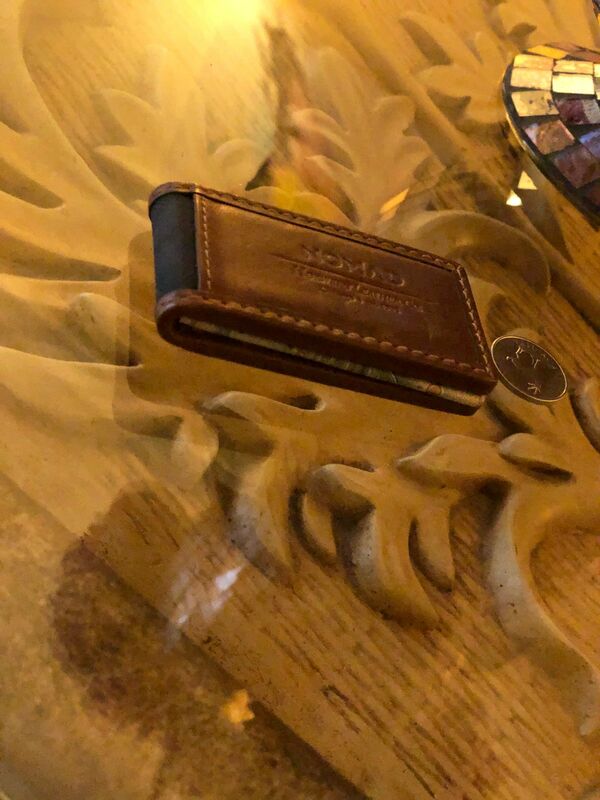 Designed with Horween Leather, Money Clip keeps your cash in place. The Hypalon interior lining and integrated neodymium magnets provide a strong, grippy clasp to hold 18 folded bills with ease. Tony G. Reviewed by Tony G.
This is a very well made product; high quality with a strong magnet clip. The leather finish is stunning. Anish M. Reviewed by Anish M.
Beautiful thing comes in small sizes. This a very nice piece of money wallet. Extremely use full..
For the days I want to go light!!! Very strong magnet, carrying enough cash on the go. With one or two cards on my phone case and the money clip I am set to go.